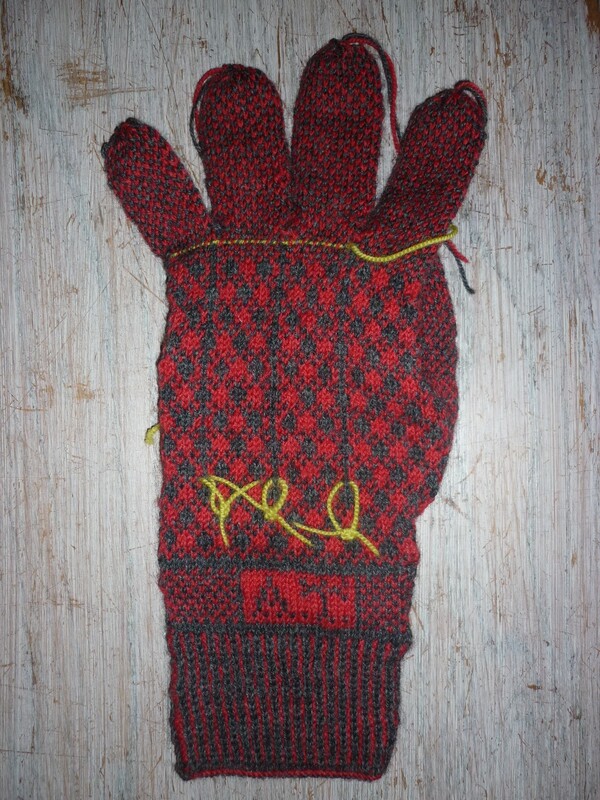 Well I finished the Prince of Wales gloves yesterday morning, 12 June, darning the ends in before I had breakfast. They haven’t been pressed and I don’t have a picture yet but I wanted to note another pair is complete. 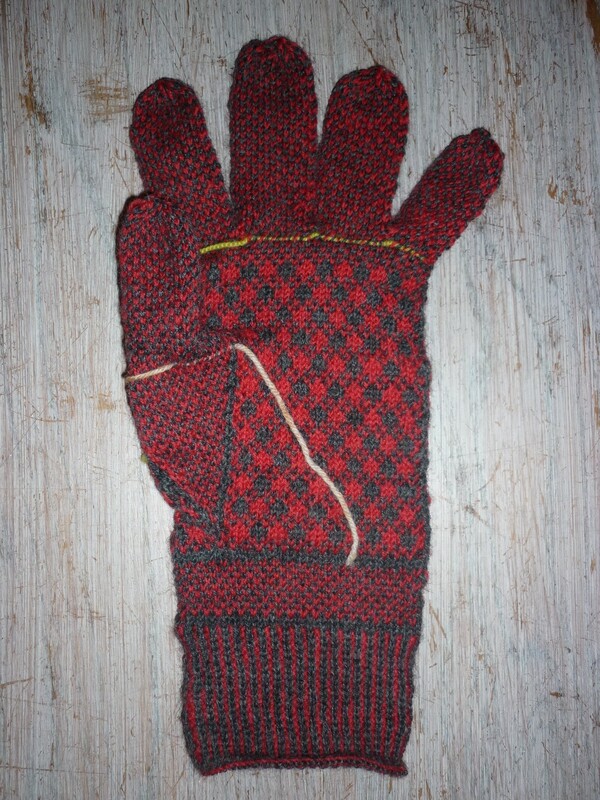 I like these gloves, I have enjoyed knitting them and am looking forward to building some designs on these patterns. 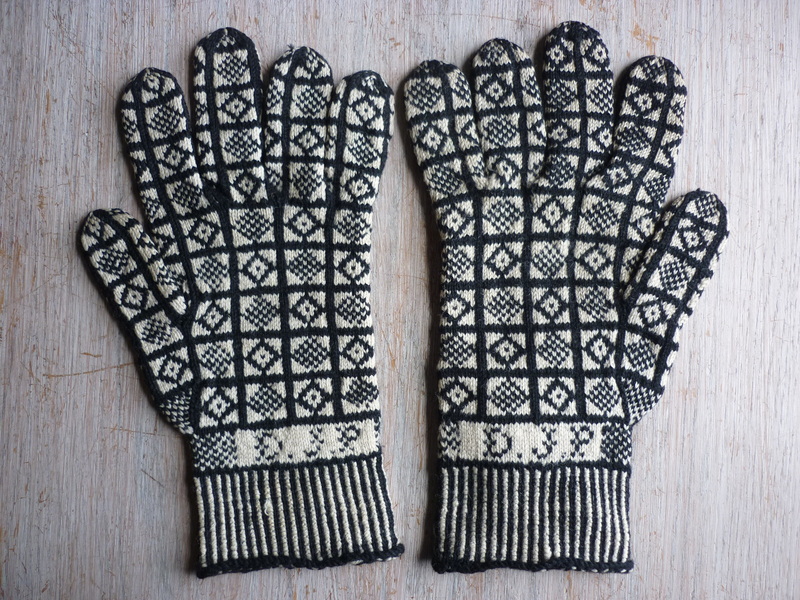 I’m still not sure what themes to use for the series of gloves that I would like to knit – for example, should dI knit them all the same size so they look uniform or should I size them to suit various friends so that I can give them away? I don’t know. 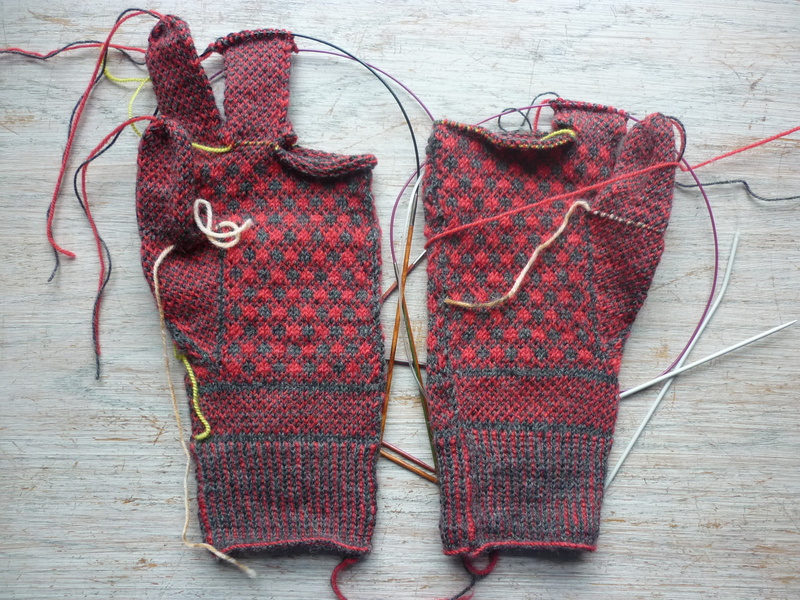 The left hand glove is complete – although the ends need to be darned in. I leave the marker threads in so that I can count accurately for the second one. These are going faster than I was expecting. I’ve forgotten to take pics and now I’m up to the fingers and done both thumbs. Progress is quite speedy I think because the wool is good and I can follow the pattern without any charts. 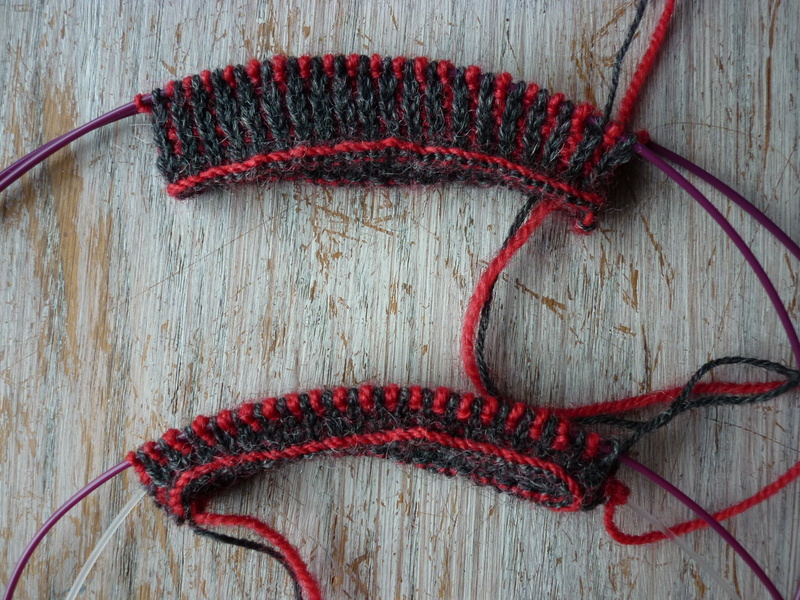 I’ve had a good few days for knitting – long distance train journeys and taking grandchildren to swimming lessons for instance so I’m up to the thumbs – and past. 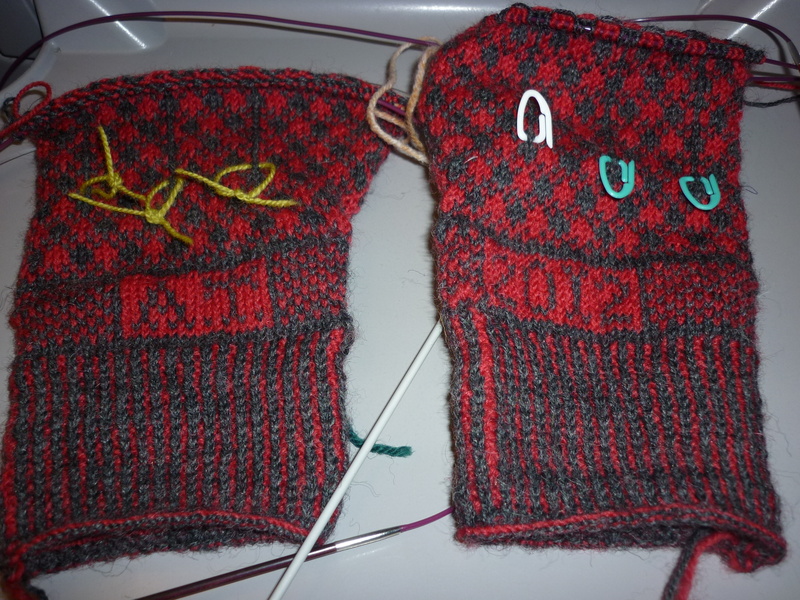 I’m loving knitting these gloves – I think it’s the yarns and the pattern. I think I’ve also found that the 3 ply on 2.25mm or 13 UK needles is just right for the type of fabric I want – firm but not too tight, and finally coming more even. Here they are on the seat back table on the train back up t’North. This wool, the Regia sock wool and the vintage 3ply pure wool are knitting nicely I think and I’m pleased about how things are going. I’ve finished the ribs which are in the Mary Allen style and look good although I find it hard to keep the tension constant. Each time I sit down to knit it’s a bit different and I have also been plagued with sweaty hands again, even when I’m not especially warm. It’s a tension thing in all senses of the word and makes knitting difficult and not very enjoyable. 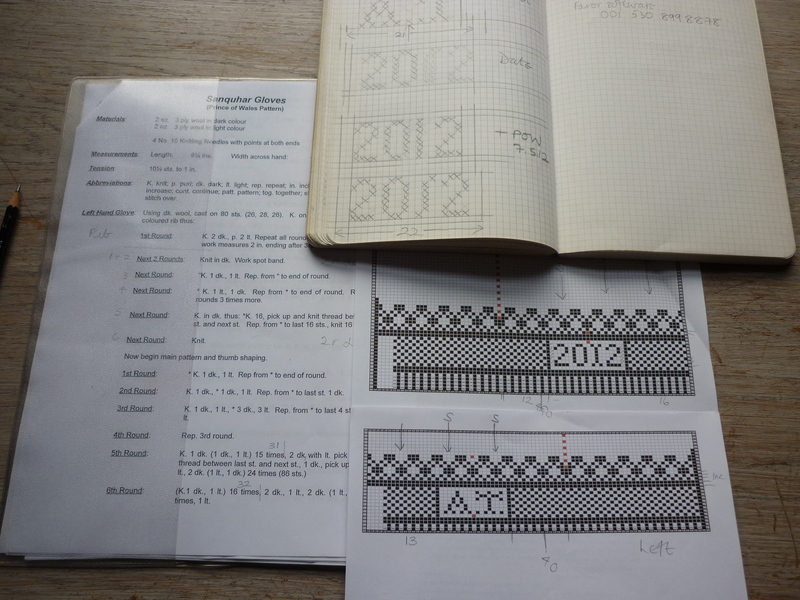 The other thing I’ve started to get the hang of is the knitting pattern software – Intwined Pattern Studio. It’s taken a while as I don’t find it that intuitive but now I’ve got it working it’s quicker than pencil and graph paper I think – and can be enlarged too which is great. So I sat last night with the chart on the screen of the laptop and knitted the initial on the left cuff. So that’s an improvement! I’ve spent most of the day, off and on, working out the pattern for these and knitting. 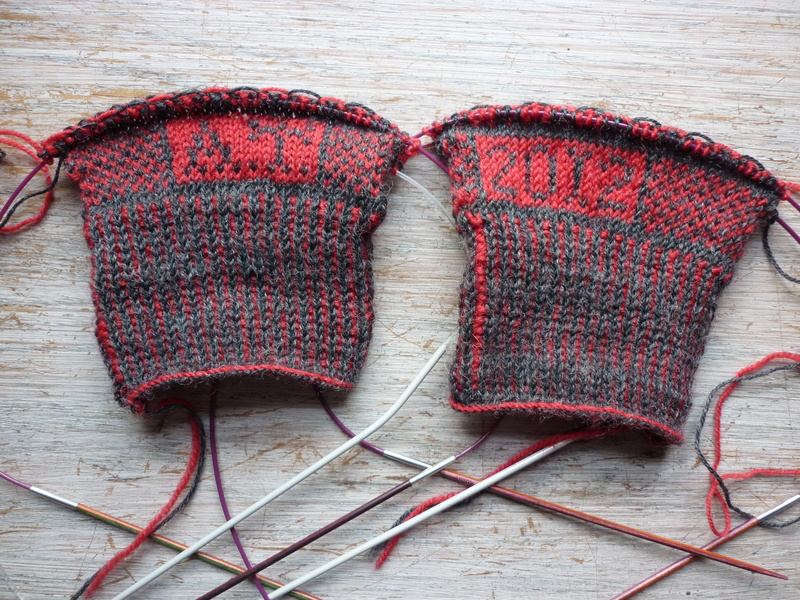 So now I’ve cracked the date and initials – always a hurdle – and am on the hand pattern. The placing of the initials and date is not symmetrical – but it will be when the back of the hand pattern takes shape with the three vertical lines up the back. Then the little panels should fall evenly under them. I have spent a LOT of time sorting this out – and am not convinced! I have though, put the written pattern onto a chart using graphs paper and pencil to get general placings – and then into a chart in Intwined Pattern Studio. Now I’m more familiar with it, it does seem to be quick, although not necessarily easy. Here’s all the paper work and scribblings. While charting on the computer, I’ve been puzzling out how to indicate the thumb increasing. Seems the best way might be to show a stitch with the base of it and then do a separate chart. The ease with which you can increase and decrease in the row in hand knitting has always been a problem for charting. Actually doing it is so much easier. Is that why the patterns were written in full rather than charted? Anyway, the fun that is the thumb doesn’t start for a couple more rounds! I’ve finally managed to carve out the time, of the right sort, quiet, good light, not in a rush, and so on, to get these on the needles. 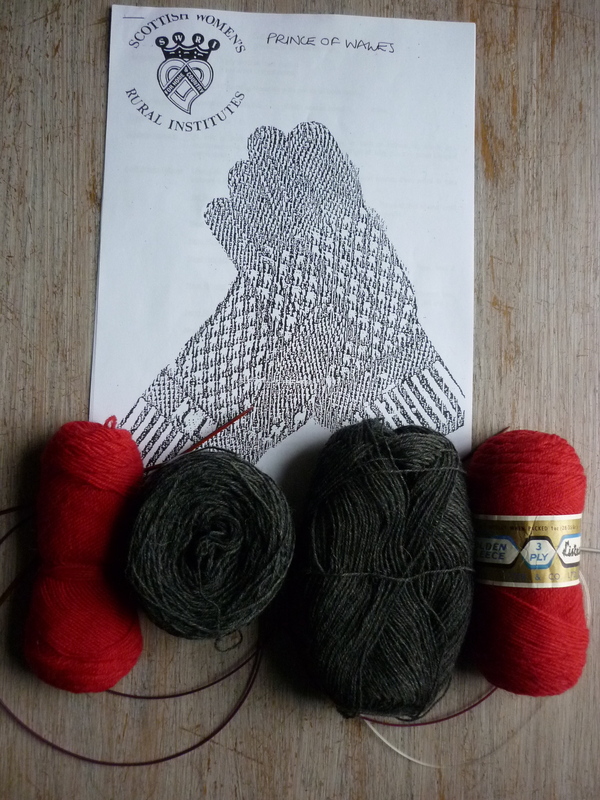 I’m doing the Dales Mary Allen type case on and single rib – one of the Sanquhar pairs from the Knitting and Crochet Guild collection has this and it think it will match well with the small stitch patterns on these gloves. This is it here. The Prince of Wales check is a small pattern and great to knit as it only has two rows.. but I think I’ve said about that already. Well it’s going to be gloves. Two colour. Red, charcoal, light grey, cream or navy … plus one or two other colours of vintage 3 ply wool courtesy of the Knitting and Crochet Guild. I decided not to pursue the diamond pattern just at the moment. I tried a prototype pattern on a sample piece that I have been knitting and it’s not quite right yet. The centre portion is my version of the gloves pictured in the From my Phone! The top section is Prince of Wales check which I like knitting very much. 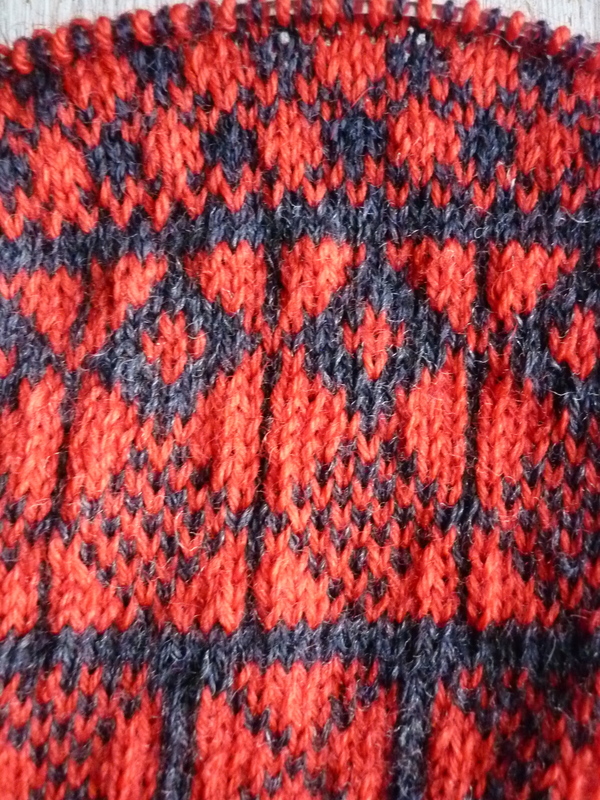 It is the same two pattern rows as the Shepherd’s Plaid – 1 row K1 red, K1 charcoal and one row K3 of each colour. It’s just different numbers of rows to make the pattern different. fascinating. 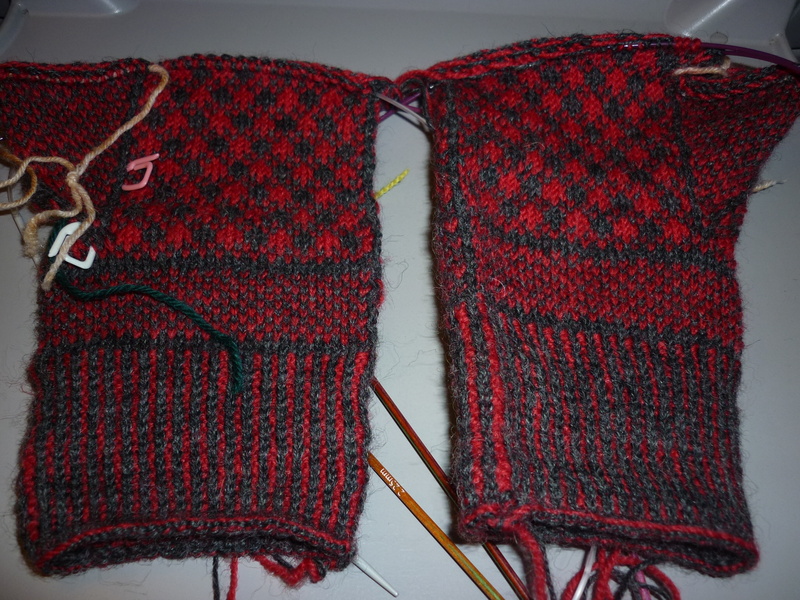 So I’m going to knit a pair of Prince of Wales check gloves based on the SWRI pattern. 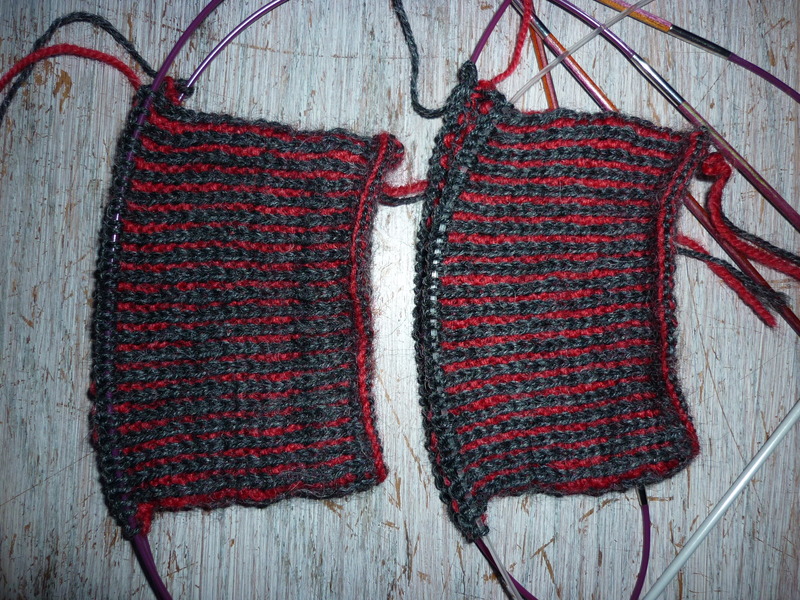 The yarn is dark grey 3 ply Regia sock wool and Lee Target pure wool 3 ply vintage yarn in red.